Blog Have you paid you stupid tax? Have you paid you stupid tax? Exchange Traded Funds (ETF’s) are all the rage in investing circles these days. For those readers new to investing, an ETF is something you can invest in that gives you access to a variety of stocks with one purchase. Rather than buying one company on the stock market, you can buy an ETF – which gives you exposure to all the companies held in that ETF. For example, if you want to invest in the biggest 200 companies in Australia you can go and buy shares in all 200 companies one-by-one, or you can by an ASX 200 ETF. There is one thing that all investors that own an ETF must be mindful of. Something that should be more obvious but continues to catch investors unawares. In fact, it is a mistake so often made that it has become known as a ‘tax on stupid’. I’m talking about ETF fees. Sometimes you see them labelled ‘expense ratio’ or ‘management costs’ but whatever they’re called they mean the same thing. Less money for you at the end of the day. If you are looking to buy an ETF there is no need to pay a cent more than is absolutely necessary. Yet for some reason people continue to do so. So you can see that despite following the same index, SPY has fees that are double IVV. So what? I hear you say, 0.04% or 0.09%, they’re both basically nothing. Well take the following hypothetical. Let’s say I have two lots of $100,000 and I invest one in each of these ETFs. Then let’s assume that they both grow at 10% every year for 20 years. If I’m paying 0.04% I will pay $5,318 in fees. However, if I am paying 0.09% I will pay $11,908 in fees. So over the long term these fees do add up. 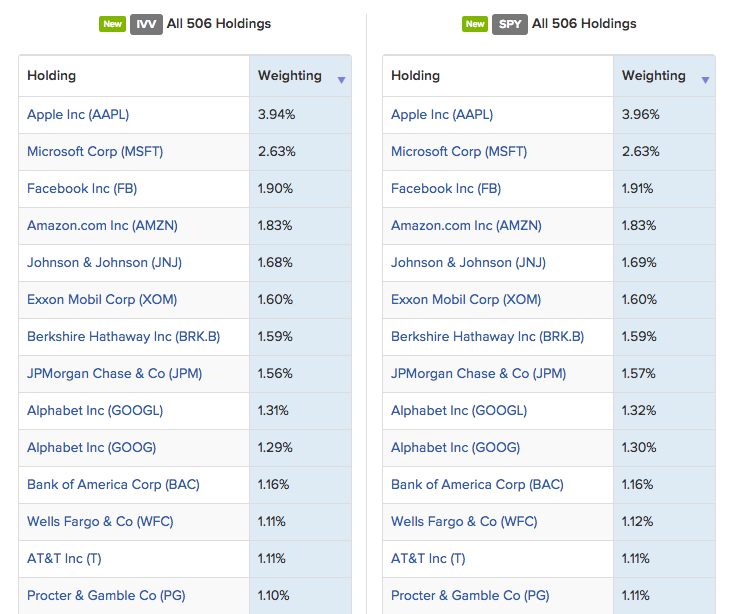 As you can see, both ETFs own the same companies. So if both ETFs own the same shares why would you pay more fees for the same thing? Here at Equity Mates we’re not sure why, but the fact is people keep doing it. Hence why some people call these extra fees a ‘tax on stupid’. So the simple advice to avoid paying extra fees – always do a final step in your research. Once you are confident about buying an ETF, just do a quick google search and make sure there isn’t a similar ETF with lower fees. That way you’ll make sure you’re never forced to pay the stupid tax.